The transition from novice to expert nurse has been an important topic in nursing circles for more than 30 years, since Patricia Benner adapted the Dreyfus model of skills acquisition to the nursing profession. The model still serves as an excellent conceptual framework for the professional development of new nurses. Combined with core competencies from the Quality & Safety Education for Nurses (QSEN) initiative as the foundation for preceptor education, the model provides a road map for assessing and evaluating skills acquisition of new nurses or new preceptors. QSEN competencies include patient-centered care, teamwork and collaboration, evidence-based practice, quality improvement, safety, and informatics. The impetus to anchor preceptor education to a solid framework rests on evidence that prelicensure nursing education, although sufficient for fostering formation of professional identity and ethical comportment, doesn’t provide hands-on clinical experience. By focusing on well-defined competencies such as those outlined in QSEN, preceptors can better guide novice nurses on what skills to focus on and develop. a redesigned and interactive preceptor education model based on QSEN competencies. In the United States, the average age of the practicing nurse is near 50. Contrast this with 31—the average age of nurses graduating with their initial nursing degree (considerably higher than the 1985 average age of 24). Additionally, 52.8% of new RNs received a previous bachelor’s degree and 7.2% hold a master’s degree or higher. The implications of these evolving demographic trends vary and require careful consideration when planning preceptor education. For example, older students with higher qualifications may be more experienced and have more confidence in addressing patient-care issues than traditional nursing students. When planning preceptor education, the overall lived experiences of new RNs must be taken into account. Considering that preceptors generally are chosen from a pool of more experienced senior nurses, the potential for transferring hard-earned clinical skills and professional comportment is significant. Failing to use this prolific source of human capital to the full potential as knowledge, skills, and attitude transfer agents would result in a great loss. Because a growing majority of new RNs are entering nursing with professional backgrounds, they bring valuable and diverse life experiences that can be harnessed to shape their competencies in clinical judgment and technical proficiency. Situated learning, reflection on action, and outcomes measurement are a few examples of evidence-based practices in high-quality preceptor education. Situated learning uses contextualized scenarios based on actual events and demands of the nursing unit. Interactive exercises in small group discussions using realistic and unfolding precepting case scenarios engage would-be preceptors in situated learning, helping them analyze and solve practice issues that might arise during preceptorship. In this type of preceptor education, five carefully designed scenarios dealing with such issues as generational differences, experiential or learning gaps, missed opportunity, safety breaches, and work­around and work ethic issues are appraised and critiqued. Learners are asked to identify safety concerns, handle crucial conversations, suggest a quality-improvement or a research project to address the issues identified, and reflect on the merits of precepting best practices. Learners then present their work to their peers and the facilitator uses reflective questioning to address nuances of the scenario. Reflection on action is a deliberate ongoing process of learning from experience that will shape clinical judgment for future situations. Because precepting is a high-stakes interface among staff members and patients, it can cause significant stress. 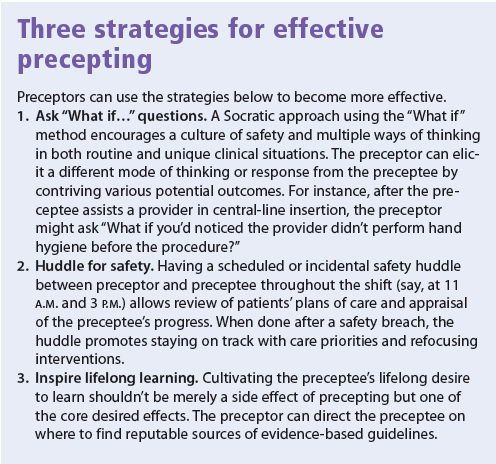 Effective preceptor education should allow exploration of novel precepting challenges, either in carefully designed scenarios or anecdotal reports from participants. The goal of reflection on action is to highlight what preceptors gain from their experience that contributed to their ongoing professional development and to build capacity for clinical judgment in future situations. Seen through the lens of the QSEN competencies, preceptor education prepares future preceptors not only as socializers of novice nurses into the profession, but also as guardians of patient safety and quality care. A conceptual or theoretical framework is an essential foundation for a well-designed preceptor education. In organizations with Magnet designation, creating a preceptor unit practice council fosters an impetus to provide evidence on measurable outcomes. Fidelindo Lim is an assistant clinical professor at New York University College of Nursing in New York, N.Y. Kimberly A. Weiss is a clinical nurse specialist in the postanesthesia care unit and Ingrid Herrara-Capoziello is a clinical education specialist and coordinator in the Office of Professional Development at the Hospital for Special Surgery in New York, NY. Benner P. From novice to expert. Am J Nurs. 1982;82(3):402-7. Benner P, Sutphen M, Leonard V, Day L. Educating Nurses: A Call for Radical Transformation. San Francisco, CA: Jossey-Bass; 2010. Budden JS, Zhong EH, Moulton P, Cimiotti JP. Highlights of the National Workforce Survey of Registered Nurses. J Nurs Regulation. 2013:4(2):5-15. Dreyfus SE, Dreyfus HL. A Five-Stage Model of the Mental Activities Involved in Directed Skill Acquisition. ORC, 80-2, Operations Research Center, University of California, Berkeley. 1980. Ramsburg L, Childress R. An initial investigation of the applicability of the Dreyfus skill acquisition model to the professional development of nurse educators. Nurs Educ Perspect. 2012;33(5):312-6. Tanner CA. Thinking like a nurse: a research-based model of clinical judgment in nursing. J Nurs Educ. 2006;45(6):204-11. From our readers…Nonadherent or compassion challenged?